John Kerry has suffered his first gaffe as the new U.S. secretary of state, inventing the nation of “Kyrzakhstan.”In an embarrassing slip of the tongue, Mr. Kerry last week praised U.S. diplomats working to secure “democratic institutions” in the Central Asian country, which does not exist. The newly-minted diplomat was referring to Kyrgyzstan, a poor, landlocked nation of 5.5 million, which he appeared to confuse with its resource-rich neighbour to the north, Kazakhstan. The State Department kindly omitted the error in the official transcript of Wednesday’s speech, which Mr. Kerry delivered on the eve of his first foreign trip as secretary of state. Mr. Kerry’s flub was all the more awkward, because Kyrgyzstan is a key ally in the U.S.-led war in Afghanistan and a major recipient of U.S. aid, which totalled $41 million (£27 million) in 2011. Mr. Kerry is not the first top U.S. official to be left tongue-tied by post-Soviet geography, much of which was split up into a myriad “-stan” countries following the collapse of the Soviet Union. 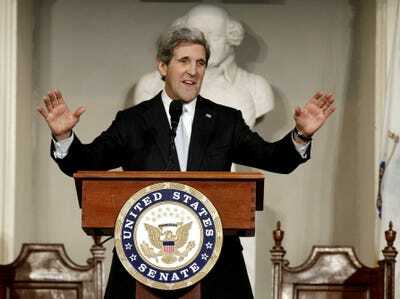 Mr. Kerry arrived in London on Monday, where he was scheduled to meet with Prime Minister David Cameron, William Hague, the Foreign Secretary, and MI6 chief Foreign Secretary William Hague, and MI6 chief Sir John Sawers.